Need a Little Writing Inspiration? If you are feeling stuck, chek out I Wrote It Anyway, an anthology of essays edited by Caroline Donahue and Dal Kular. The book features 30 inspiring essays from a variety of indivduals. I am super honored and proud to be a contributor to the book and among so many talented and inspring individuals! The book is availalbe on Amazon now! “Have you ever dreamed of writing, but let something stand in your way? In this collection of 30 essays, new voices and experienced authors share inspiring stories about overcoming the obstacles to writing that stopped them in their tracks. From mental and physical health, perfectionism, isolation, lack of time in a busy world to stories from the front lines of the #metoo era, you'll find a story that speaks to your personal block. In this day and age, writing has the potential to bring people together like never before. If you believe you have a book in you, or have always dreamed of writing, let this collection motivate you to follow through on that dream. Every single one of the contributors felt tremendous fear when beginning to write, but in the end they wrote it anyway. 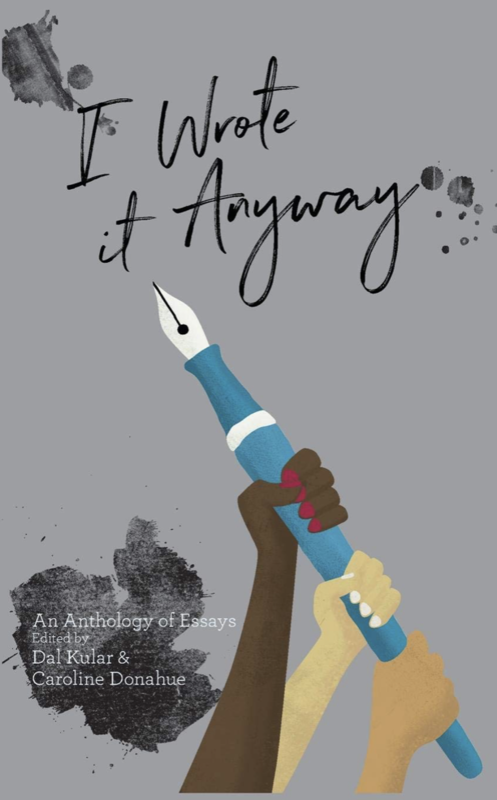 All proceeds of this collection benefit 826 LA in the US and Arts Emergency in the UK.” - I Wrote It Anyway Back Cover, Edited by Caroline Donahue & Dal Kular, Secret Library Press, 2018.